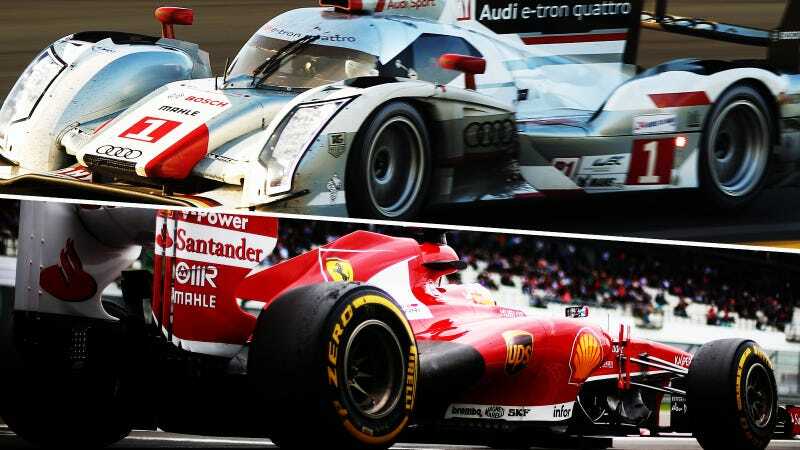 What's More Recognizable To Non-Gearheads: Le Mans Or F1? F1 is a bit of a mess these days, despite some calls that the sport is in a golden age. If you ask me, sports car racing could very well make its way up in prestige in this age of the reviled Bahrain GP, DRS, and exploding tires. But which sport has more recognizable brands? The question is, when you mention F1 or Le Mans to complete non-gearheads, which will have more names that they'll recognize? The average person doesn't really care how teams like Oreca or Pescarolo does at the 24 Hours of Le Mans, nor do they care that Caterham got more championship points than Marussia in the last Singapore GP or whatever. So here's a list of universally recognizable names in sports car racing's top tier next year compared to the number of universally recognizable names in F1's next season. I won't include Nissan, because their ZEOD RC isn't running in LMP1, but rather in the experimental Garage 56 slot. Also, its name is silly. I'm leaving out all of the Porsche/Ferrari/Aston Martin/Corvette sports car brands, as they don't compete for the top podium spot and, in turn, the big headlines. Initially I wasn't going to include Lotus on the F1 list, but I'd rather leave it in a 'maybe' file. There are a bunch of people who remember when Lotus was a somewhat healthy company that made the submarine car that was in that James Bond movie, though the brand is dying out these days. In any case, the team is really just Renault F1 (a car brand that the whole world recognizes) under a new name. It's possible the team will revert and F1 will have four properly big names on the field. Also, the P1 hybrid supercar might make McLaren a common name to non-car enthusiasts, in which case F1 could bump up another spot. I count that as three and a half brands for F1 versus three for LMP1. That puts F1 ahead of sports car racing for now in terms of big brand recognition, but I still think sports car racing has some potential to jump ahead if they work for it. If Porsche shows that Audi is particularly vulnerable, maybe Nissan would step up to LMP1 and get into some headlines, and then who knows who else might join in. Then again, maybe I'm crazy. Maybe a twelve-year-old in Nairobi or anywhere else knows that a company called Williams makes cars like Ferrari. Maybe I should really be comparing big races as opposed to manufacturers? Maybe Le Mans gets more coverage than the Monaco Grand Prix, but surely the Indian GP gets more viewership than the Six Hours of Spa. Or maybe Bernie Ecclestone and NASCAR's France family will keep ruling the world's motorsports scene and everything will keep going as normal for the next decade.